In a response to Paul Krugman’s continuing puzzlement over the Brexit shock, Brad DeLong tries to claim Krugman is making some sort of basic error. It i is not easy to spot what it is but he does commit one himself. He thinks that the main channels for the working of a devaluation are greater exports and a rebound in (?overseas) investment once the currency has dropped far enough and make UK costs internationally attractive. As I tried to show in my previous post, the main channel for devaluation is domestic not international. The worsening of the value of the pound stimulates nominal demand in the UK, so long as the central bank does not fight it with monetary tightening – aka “defending the currency”. The domestic currency is less valuable, in terms of the goods and services it will buy and this is a good thing. It will prompt people to spend money more quickly, the hot potato effect” in action. This faster circulation of money, higher velocity, will increase Aggregate Demand and be a successful fightback against the potential Aggregate Supply shock. The market’s immediate response was a mix of political and economic fears, while technically trying to factor the most likely near term impact of leaving the EU – like lower FDI, reduction in output via moving production to EU ex-UK, and indirectly less UK labor demanded, etc. The rise in Aggregate Demand may not mean in real terms the UK economy will not lose out from the potential Aggregate Supply shock, but it will prevent the potential AS shock from turning into a damaging recession. It will also allow the government time to negotiate new trade relationships with the EU and others and for the real economy to then respond to the new arrangements – which may turn out better than the worst case assumed by dazed (or is it crazed) Europhile doom-merchants , or better than now as Brexiteer economists have modelled. The devaluation channel is not “more exports” or “more foreign investment”. This is naive despite a widespread belief of much of the financial commentariat that it is the main channel. I would have supposed that someone as knowingly iconoclastic as Brad DeLong would not have fallen into this sort of trap. Brad DeLong may be making a second huge error, but it is hard to tell. He has a chart in the post that shows UK Gilt yields collapsing after 2008. He doesn’t refer to it in the text but does claim 2016 is different from 1992, when the UK left the Exchange Rate Mechanism and saw a mild potential AS shock swamped by massive monetary easing as the GBP devalued. I think he may be claiming that because Gilt yields are already on the floor there can be no more easing. If so, then he is making a very common error that associates low interest rates with monetary easing. Low rates are a sign that monetary policy is or has been tight, high rates that monetary policy is or has been easy. In an LT world, “murder” is OK! But we are living in a world where, for the time being — and maybe for a long time to come, if secular stagnation theorists are right — mercantilism makes a fair bit of sense. Oh my! PK must think that having a NP gives him a ‘license to kill”. Fortunately, secular stagnation theorists seem to be wrong. Furthermore, appeals to liquidity traps is not convincing, As the charts show, World Trade Blues reflect a languishing global economy, i.e. weak global aggregate demand! This is true and an important insight. But it seems to elide the main issue. Where is the deus ex machina? Where is the can opener? The essence of the secular stagnation and hysteresis ideas that I have been pushing is that there is no assurance that capitalist economies, when plunged into downturn, will, over any interval, revert to what had been normal. Understanding this phenomenon and responding to it seems the central challenge for macroeconomics in this era. Any analysis that assumes restoration of previous equilibrium is, from this perspective, missing the main issue. I was glad to see Paul recognize this point recently. I suspect it will lead to more emphasis on fiscal rather than monetary actions in depressed economies. Summers is right about the relative seriousness of the Japanese demand deficiency problem. Japan´s monetary blunder was “criminal”, and the fiscal action that followed was nothing less than overwhelming (with countless bridges, some to nowhere, and even an airport over water). However, that did not help at all given the “dead in the water” monetary policy! The two charts illustrate. 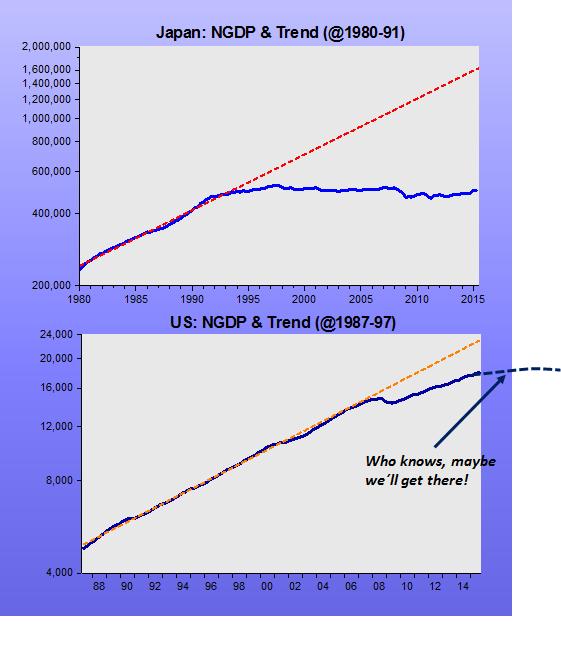 The Japan NGDP trend is estimated for 1980-91, while the US trend is the Great Moderation trend established during 1987-97. Bernanke’s basic theme is that the shocks of 2008 were bad enough that we could have had a full replay of the Great Depression; the reason we didn’t was that in the 30s central banks just sat immobilized while the financial system crashed, but this time they went all out to keep markets working. Should we believe this? It’s not a hard story to tell — and I very much agree with BB that pulling out all the stops was the right thing to do. You don’t play games at such times. But I’m not persuaded that the real difference between 2008 and 1930-31 (which is when the Depression turned Great) lies in central bank action, or related bailouts. 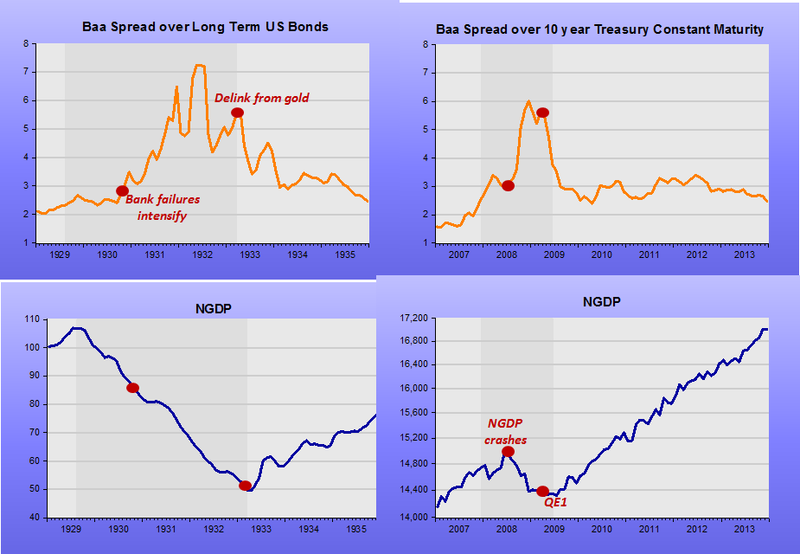 So really, was putting a limit on the financial crisis the reason we didn’t do a full 1930s? Or was it something else? And there is one other big difference between the world in 2008 and the world in 1930: big government. Not so much deliberate stimulus, although that helped, as automatic stabilizers: the U.S. budget deficit widened much more in 2007-2010 than it did in 1930-33, even though the slump was much milder, simply because taxing and spending were much bigger as a share of GDP. And that budget deficit was a good thing, supporting demand at a crucial time. 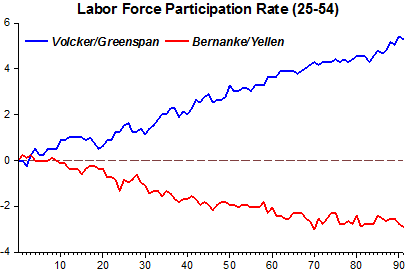 Again, Bernanke and company were right to step in forcefully. But I’d argue that the fiscal environment was probably more important than monetary actions in limiting the damage. The charts below allow for a different narrative. Notice that the “financial disruption” in the Great depression only began 15 months into the economic contraction, being responsible (“propagating”) the second stage of the contraction. When did it end? When FDR delinked from gold and NGDP turned around. The “financial disruption” in the Great Recession was “front loaded”, with financial disruptions beginning even before the start of the recession. What seems to have “propagated” the financial disruption after mid-2008 was the Fed allowing NGDP to “shrink”. The fact that the “financial rescue services” quickly went into action helped avoid another dive in NGDP as happened in 1931. In other words, “propagation” this time around was avoided. When did the “financial disruption end? When, in addition to rescuing finance houses, the Fed introduced QE1 in March 2009. Just like FDR´s action in 1933, Bernanke´s action in 2009 reversed the course of “fate”, only in Bernanke´s case, the action was excessively timid. The main point, however, is that in this version of the comparative stories the “fiscal actor” (big government) does not get to go on stage! Those charts just show the central bank doing its job. In the 1930s by abandoning the gold standard to provide the necessary accommodation. In 2009 by furnishing liquidity and avoiding rate spikes. In doing so they don’t crowd big government off the stage, they keep the stage from collapsing so the show can go on. If the central bank is doing its job in accommodation though, it can’t “do more” and whether anything happens on the stage or not depends on degree to which the government steps up with the necessary spending and this chartdetermines the pace and quality of NGDP recovery. Despite increasing fiscal stimulus in 2007-09, the real economy is tanking together with nominal spending. 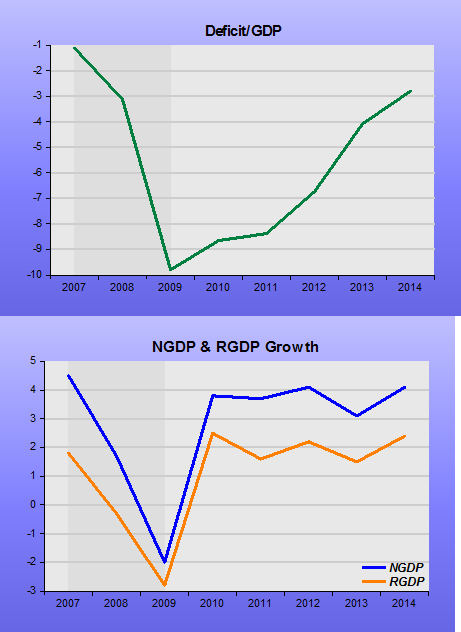 When NGDP growth turns up, so does RGDP growth. And note that despite increasingly contrationary fiscal policy in 2011-14, RGDP growth hums along at a stable rate, dancing to the tune of stable NGDP growth. There is good reason to believe that the conventional 2 percent inflation target is too low, even for the United States; the risks of hitting the zero lower bound are clearly much higher than people believed when 2 percent became orthodoxy. The risk of hitting the ZLB is not due to the particular target level, but flows directly from central bank´s ‘mismanagement’ of monetary policy and letting NGDP growth tank. Also, central banks all over are not even hitting their “low” inflation targets, and that´s not because of some “liquidity trap” situation, but because NGDP growth has been constrained to be too low. 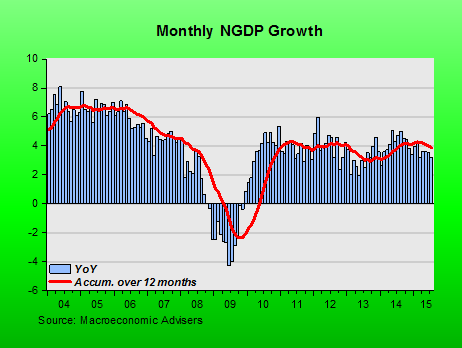 While before the crisis NGDP growth chugged along at 5.5%, for the past five years it has clocked just 3.8% (and that means the LEVEL of spending is much lower than previously). Before the crisis, unemployment was falling and inflation was “on target”, averaging 2.1%. For the past five years, unemployment has fallen significantly, but inflation has averaged only 1.5% (and may go lower, given that NGDP growth is ‘slipping’). When Yellen alludes to China, oil and commodity prices, the exchange rate of the dollar and whatnot to “explain” the (temporarily) low inflation, she demonstrates that the FOMC is clueless about the true causes of “lowflation” and low growth. 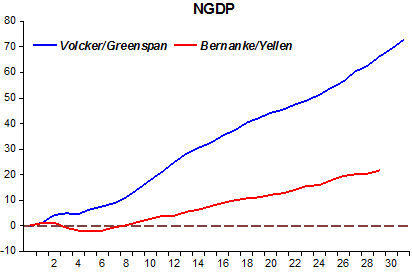 In reality, all those “facts” are in no small measure a consequence of too tight US monetary policy, as indicated, not by the particular level of the FF rate but by the low level and low growth of total nominal spending (NGDP). As market monetarists have been saying for a long time, Stop Talking About Inflation. German Finance Minister Wolfgang Schaeuble sought to turn the tables on critics of his fiscal-discipline push, saying he’s actually the better Keynesian. Schaeuble, the guardian of Germany’s balanced budget and Chancellor Angela Merkel’s point man on austerity in the euro area, dealt a slap at antagonists such as Nobel laureate Paul Krugman by rebuffing “star economists” who advocate deficit spending. Instead, years of debt reduction are giving Germany the leeway to pump at least 6 billion euros ($6.7 billion) into the economy next year as aid for a record number of refugees arriving in the country, Schaeuble said. Just a further thought about Reaganolatry: consider the track of unemployment under two presidents. One is lauded as the ultimate economic hero and savior; the other reviled as an economic failure, who killed jobs by being nice to poor people and insulting job creators. The chart compares their records. OK, you can come up with reasons why president#2’s record isn’t as good as it looks. But is there really enough contrast there to justify the difference in perception? How much of what we’re looking at is the psychological impact of a V-shaped recession — things got really bad, so there was a sense of relief when they got better? How much is simply the result of decades of propaganda? Anyway, I’m surprised that this chart isn’t more widely discussed. The first thing I do is to consider only the prime age population (25-54) to minimize demographic changes. The unemployment chart is very similar. 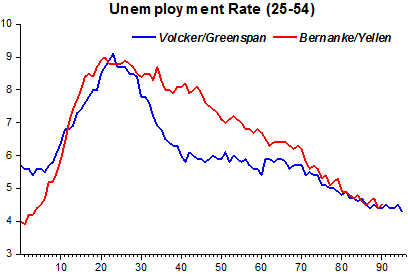 But when you look at what´s behind it, the labor force participation rate for prime age workers, you see that the unemployment rates in the two episodes are not comparable! In any case, what´s really behind the economy´s very different performance in the two episodes is not Reagan/Obama but the Volcker/Greenspan Fed and the Bernanke/Yellen Fed. The Fed controls the nominal economy, which irradiates effects on the real economy. The chart shows why there was a V recession in the first episode, giving out a “sense of relief” that is not felt in the second episode! Is Iceland Krugman’s Inadvertent Case for the Monetary Policy Offset of Fiscal Policy? “I was, I think, one of the first commentators to notice that a funny thing was happening in Iceland: the nation that was supposed to be Ground Zero for financial disaster was actually having a milder crisis than many others, thanks to heterodox policies — debt repudiation, capital controls, and massive devaluation. Now, as Matthew Yglesias points out, Iceland is getting ready to lift the controls, and its experience still looks remarkably good considering the circumstances. Anyone who came away from reading Krugman’s posts, and the posts to which he links, might be forgiven for concluding that Krugman thinks that Iceland, unlike Latvia and Ireland, did not do any fiscal austerity at all. But Scott knows something is fishy in the state of Iceland, and looks into Krugman’s implied claim. As often is the case, in my opinion Scott is somewhat understating things. Scott is looking at the “net operating balance” which excludes the “net acquisition of nonfinancial assets”. Including this item results in “net lending”, which is what Europeans call “the deficit”. The net lending of Iceland’s general government fell from 9.7% of GDP in calendar year 2009 to 1.7% of GDP in calendar year 2013, a change of 8.0% of GDP. Moreover, Iceland’s general government budget ran a surplus equal to 1.8% of GDP in 2014, or a change in fiscal stance since 2009 equal to 11.5% of GDP. This can be found on Table A1 of the April 2015 IMF fiscal Monitor. And, according to IMF estimates, Iceland’s output gap was actually somewhat larger in 2014 than in 2009. When an economy becomes more depressed it usually results in falling revenues and rising expenditures as a percent of GDP. Not taking this into account might tend to understate the amount of fiscal austerity a country has engaged in (e.g. Greece). Table A3 shows that Iceland’s general government cyclically adjusted balance rose from a deficit of 10.0% of potential GDP in 2009 to a surplus of 2.7% of potential GDP in 2014, or a change of 12.7% of potential GDP. But even this tends to understate the amount of fiscal austerity that Iceland has engaged in. This is because it includes the increase in spending attributable to rising interest payments on the national debt. To get a proper idea of the amount of fiscal austerity that Iceland has engaged in (i.e. cuts in direct spending and increases in taxes) one has to look at the general government cyclically adjusted primary balance which can be found in Table A4. Iceland’s general government cyclically adjusted primary balance rose from a deficit of 6.9% of potential GDP in 2009 to a surplus of 6.2% of potential GDP in 2014, or a change of 13.1% of potential GDP. By this standard Iceland has done about 30% more austerity than Ireland, over double that of the UK, roughly three and a half times as much as the US, and approximately five and a half times as much as Latvia. 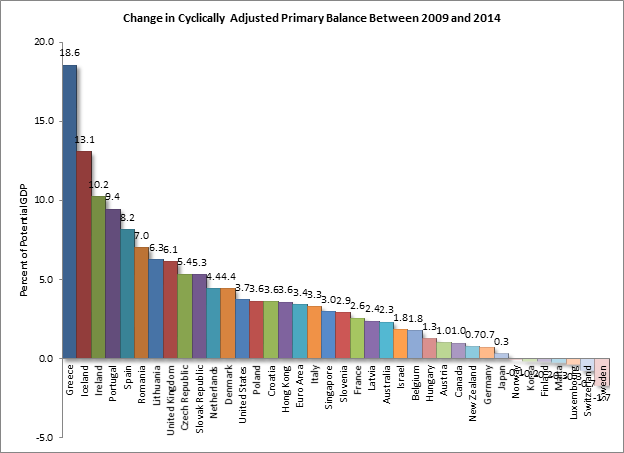 The only country that has done more fiscal austerity is Greece. None of this should come as a surprise. When nearly all the other OECD members were busy implementing fiscal stimuli in early 2009, Iceland (joined only by Ireland) was engaged in a massive fiscal consolidation (see Figure 3.2 and Table 3.1). In 2012 the Icelandic Finance Ministry, in front of an audience of fellow OECD senior budget officials, patted itself on the back for a job well done. The scope and scale of Iceland’s fiscal consolidation was truly mind boggling. Real primary expenditures were estimated to fall by 12.7% between 2009 and 2012 (Slide 16). This was accomplished by slashing current expenditures, transfers, and maintenance and investment, and by freezing public sector wages and benefits for a period of four years (Slide 13), during a time when inflation soared due to the 50% depreciation of the króna. The bottom line is that Krugman’s implied poster child for anti-fiscal austerity is in reality the advanced world’s second leading practitioner of it. 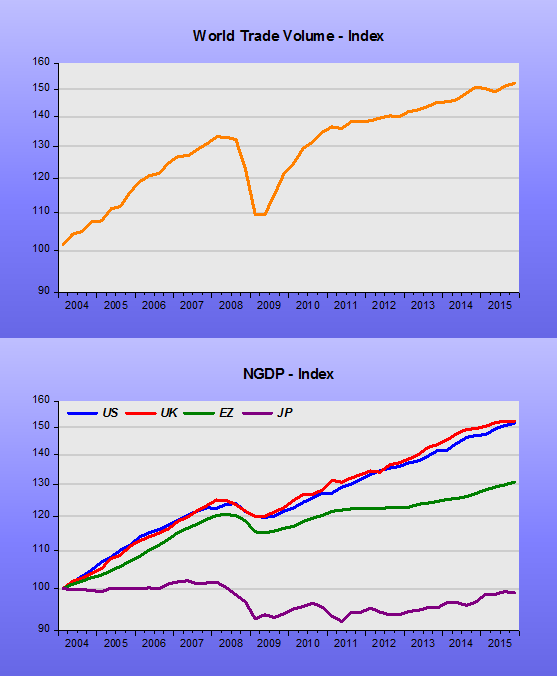 If Iceland’s economy is doing as well as Krugman claims (I have my doubts), then the only real reason it is doing so well (we have yet to see what happens after capital controls are lifted) is relatively steady NGDP growth as demonstrated in Scott’s post. Thus it seems to me that Krugman’s recent posts extolling the relative economic performance of Iceland are inadvertently strengthening the argument for the ability of monetary policy to wholly offset fiscal policy. Monetary Policy Creates Financial Instability? “Let me also add that if it’s really that easy for monetary errors to endanger financial stability—if a deviation from perfection so small that it leaves no mark on the inflation rate is nonetheless enough to produce the second-worst financial crisis in history—this is an overwhelming argument for draconian bank regulation. Modest monetary mistakes will happen, so if you believe that these mistakes caused the global financial crisis you must surely believe that we need to do whatever it takes to make the system less fragile. Strange to say, however, I don’t seem to be hearing that from (John) Taylor or anyone else in that camp.”—Paul Krugman. Krugman plays a little fast and loose here, and also ignores University of Chicago scholar John Cochrane, who has in fact called for major reforms, such as bank lending 100% backed by equity. No more 30-to-one leverage. 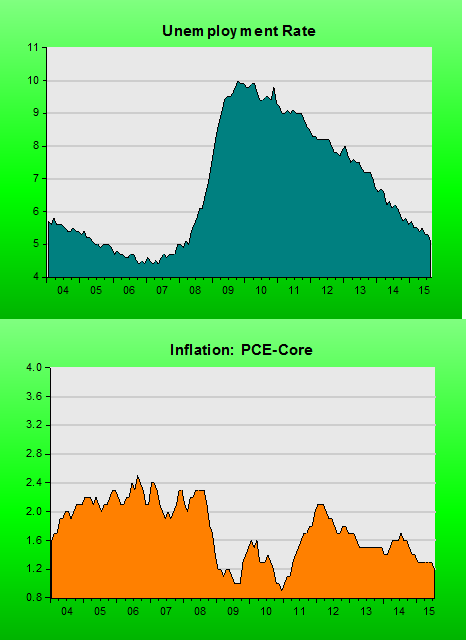 And inflation did sag after 2008, indicating monetary policy was too tight, as Market Monetarists have said. There was a “mark on the inflation rate,” such as Western economies sinking into deflation. I noticed that mark. Still, Krugman has a point. We keep hearing monetary policy is too loose, and have heard that for 30 years. Yet the developed world is in deflation or close, led by Japan. Then we had a global financial collapse. So, the record suggests the inflation-hysterics have it exactly backwards. If monetary policy has threatened financial stability, it has been because it has been too tight. We are in ZLB now—that is not a sign of decades of easy money. Krugman has a point about banks, too. How is it in the U.S. we have such a feeble financial system? Why has the right-wing no interest in measures that would create strong banks? Being “against Dodd-Frank” is not a policy. If Dodd-Frank is no good, then embrace John Cochrane, or please devise a policy that would make for strong banks. And, as I always say, print more money. Because, not printing more money will have unintended and unforeseeable but catastrophic consequences on financial stability. Well, you can take out the word not, but the insanity level remains unchanged. Kashkari should have joined the Treasury, not the Fed! Can the Eurozone be Saved?